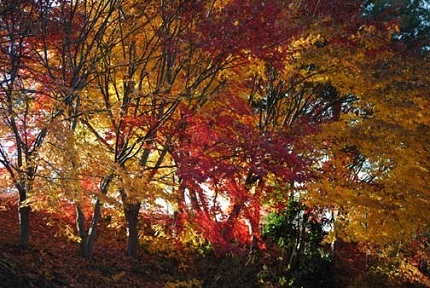 If there’s one thing we on the East Coast are known for, it’s our spectacular autumns. So I was somewhat surprised by something that happened as we were driving to the temple in late August. As we rounded a corner, two yellow leaves, in tandem, jumped off a tree in front of us and committed joint suicide in front of our car. It was still August, for heaven’s sake. The temperatures were still warm and there wasn’t a yellow leaf anywhere in sight with the exception of these two. We had not yet experienced Labor Day weekend, although it was just around the corner. There was no reason except for pure laziness that those two leaves were jumping off their tree to an early death. But those two leaves turned out to be prophetic leaves, telling us ahead of time to expect an armpit of an autumn. We are in the midst of it as I write these words. Leaves aren’t turning all colors of orange and gold. They’re just turning yellow, shriveling up, and then diving right off the trees. Some are skipping the yellow part altogether and are just shriveling up and dropping in their tracks. Usually as autumn progresses, Fluffy and I drive from one place to the next amid a profusion of color. We applaud the trees — or rather he points out the exceptional trees and I do the clapping for both of us. If he took his hands on the wheel to join in the applause, we might end up wrapped around a tree trunk, which would be somewhat defeating the purpose. This year we have applauded a grand total of (pardon me while I do the official count) one tree. It’s still early in the season, but one tree is pathetic. We should have lost count by now. The trees around us should be a riot of color. In fact, my October calendar picture shows the view that should be outside the window of our dining room — the window immediately next to me. As you can see, the palette is something that is so impressive it was put on this year’s calendar by calendar-creator Fluffy. Right now, the same view is, well, green. The view from our dining room, last October. When we were at the temple last week, the missionaries who work there full-time told us their excursion to the Shenandoah National Forest had been canceled this year, not because of the government shutdown but because there was no point in taking the hour-plus drive to see the leaves when the leaves were not performing. If people wanted to see ho-hum leaves, they could wait till next year and see them at home (wherever their homes may be). We may be disappointed to see a bad leaf year this year, but we can hardly be surprised. At least in our area, 2013 was the mildest of summers. There was a week or two of scalding temperatures, but most of the days were temperate. The humidity wasn’t horrible. There was enough rain that our lawns didn’t even die out, so even the grass and the flowers were happy. Oh, did we rejoice that we were not miserable all summer long! Oh, were we delighted that Fluffy’s daily walks were not fraught with misery! Oh, were we thrilled that the front of our house, where our “temporary” bedroom is located, was cool enough that we only had to use a fan to supplement the air-conditioner once or twice all summer! Oh, were we happy that the humidity was so low that we did not wilt every time Fluffy opened the door! Oh, were we deceiving ourselves! What we knew, but chose to ignore, was that a bearable summer does not make for a spectacular autumn. But at the same time, we only had to look up to see that one tiny leaf bucked the tide. Unlike its brothers, it turned a brilliant shade of red, leaped from its host tree, and landed in the screen on one of our bedroom windows. There it flapped merrily in the wind last week, grabbing my attention in the autumn sunlight and reminding me that even in a drab and ugly autumn, beauty is going to be there for the beholder. This brave little leaf also reminded me that there is often wisdom in not following the crowd. 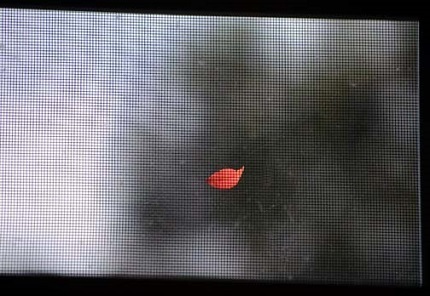 No matter how drab the rest of the season may or may not be, this one little leaf got the right idea. Like that one beautiful leaf, you and I do not have to be content with a lifetime of mediocrity. We were born for good things and destined for great ones.